Known as one of the “four heroes” of the Chinese table, ducks typically signify felicity and fidelity. Pricier than chickens, in the old days they were usually reserved for special occasions and festive banquets. 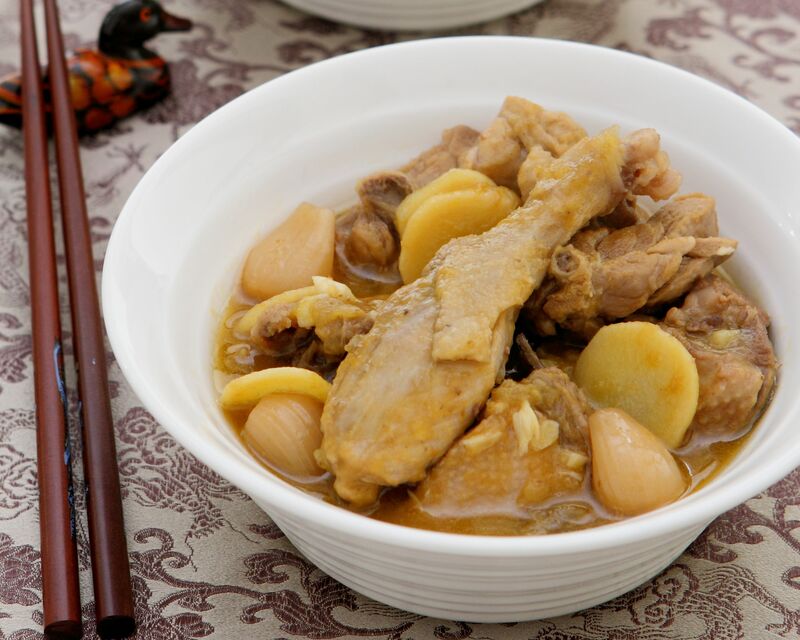 To bring this bird to the modern festive table, this classic braised duck dish or Shuin Mui Ngap from Guangdong is perked up with pickled garlic to lend it an invigorating sharpness and to balance the rich meatiness. Note: This dish tastes better when it’s kept overnight and served the next day as the flavors would have developed and become more pronounced. Sour plum sauce, pickled garlic and sour plums are sold in most Chinese grocery stores and major supermarkets. This recipe was first published in Flavours magazine. Heat up oil in a deep pot or wok. Sauté ginger and garlic till slightly golden. Add in duck pieces and continue to stir-fry for 10 minutes. Pour in the sour plum sauce then add pickled garlic and sour plums. Stir to mix well. Add in salt, sugar, light soya sauce and water. Stir mixture evenly. Lower heat and braise duck for 50-60 minutes until tender. Check if the duck pieces are tender enough before turning off the heat. Cover pot with its lid and let the duck cook further in the heat within the pot. If we cook by using pressure cooker , how long should we cook till the duck tender.